The tree now is a good preliminary tree really. They kind of stretched out the J7W in a pretty apparent, but logical, fashion. I'm confident they'll be able to find stuff and work with people. I realize, Japan needs a BnZ line to balance it out. Why does it need to be a single engine jet? Really, we could have a Kitsuka with half the weight of the 262 but roughly the same thrust. I think that would be hilarious. -Tier VIII heavy fighter: in this slot it would face the 262, the P.1056 and, eventually, the F5U. Performance wise it would be close enough. I don't like it but i don't see any other solution since, as i said, only the F7U remains as twin engine light fighter. Wait, what? I thought you were arguing against having twin engine fighters at tier IX and X? If not light fighter you could still make it Heavy Fighter because I'm not sure we have a suitable option there, although I really don't see the issue. Apparently also the devs have something called the Ne 430. I have no clue what that is. I wonder how silly of a speed we could get out of it. Ultimately it's going to come down to what aircraft are available overall. I don't have any problems what so ever with twin engine fighters, the problem is the trend WG has regarding them. In any case we shall see, i don't think WG would release another branch for Japan fairly soon. -- this post will attempt to catalog the operational locations of aircraft in order to (potentially) reveal previously unseen connections. -- this might be one way to track field modifications. Carriers: Akagi, Hosho, Kaga, Ryujo and Zuiho. 12th, 13th, 14th, 15th, Oita, Ominato, Omura, Sasebo and Yokosuka Kokutais. 2nd, 3rd, 6th, 12th, 202nd, 204th, 205th, 221st, 251st, 252nd, 261st, 281st, 302nd, 331st, 341st, 343rd, 381st, 601st, 652nd, 653rd, 721st, Genzan, Konoike, Oita, Tainan, Tsukuba, Yatabe and Southern Island Kokutais. Carriers: Kaga, Akagi, Ryujo, Soryu, Hiryu, Shokaku, Zuikaku, Shoha, Zuiho, Chitose, Chiyoda, etc. 12th, 14th, 31st, 33rd, 40th, 541st and 582nd Kokutais. Carriers: Chitose, Chiyoda, Hiyo, Junyo, Shinyo, Shokaku, Soryu, Taiyo, Unryu, Unyo, Zuikaku. Carriers: Hiyo, Junyo, Shinyo, Shokaku, Taiyo, Unryu, Unyo and Zuikaku. 551st, 601st, 653rd, 705th, 752nd, 903rd and Southern Kokutais. 1st, 4th, 5th, 9th, 11th, 13th, 18th, 21st, 24th, 33rd, 50th, 54th, 59th, 63rd, 64th, 70th, 77th, 78th, 85th, 87th, 144th and 246th Sentais. 9th, 10th, 28th, 47th and 84th Dokuritsu Dai Shijugu Chutais. Akeno Army Fighter Training School. 50th, 54th, 59th, 63rd, 64th, 65th, 71st, 72nd, 73rd, 77th, 101st, 102nd, 103rd, 104th, 112th, 203rd, 204th, 248th Sentais. 1st, 2nd, 4th, 5th, 13th, 14th, 17th, 19th, 24th, 26th, 47th and 71st Dokuritsu Dai Shijugo Chutais. Akeno, Hitachi and Kumagaya Fighter Training Schools. 9th, 22nd, 29th, 47th, 70th, 85th, 87th and 246th Sentais. 47th Dokuritsu Dai Shijugo Chutai. Akeno and Hitachi Fighter Training Schools. 101st, 102nd, 103rd, 104th, 111th, 112th, 200th and 246th Sentais. 24th Dokuritsu Dai Shijugo Chutai. 1st, 4th, 5th, 6th, 8th, 11th and 13th Rentais. 4th, 9th, 33rd, 59th, 64th and 77th Sentais. 17th, 18th, 19th, 23rd, 26th, 28th, 37th, 55th, 56th, 59th, 65th, 68th, 78th, 105th and 244ths Sentais. 23rd and 28th Dokuritsu Dai Shijugo Chutais. 5th, 11th, 16th and 18th Lensei Hikotais. 25th and 71st Dokuritsu Hiko Chutais. 27th Dokuritsu Dai Shijugo Chutai. Yokosuka, Yokohama and Otsu Kokutais; 5th, 36th and 452nd Kokutais. Carriers: All Japanese wartime aircraft carriers. Edited by J311yfish, 04 January 2016 - 01:22 AM. Should we talk about service ceiling? Nice to see a chart with that on it. Well the ceiling ingame is quite different. For example the J7W ingame is quite bad at high altitude even though it was designed to be a high altitude interceptor. Has anyone looked on the EU forums for what information they researched? That would give fighter, fighter-bomber, and attack aircraft at Tier IX and X, and basically complete the upper end of the Japanese tech tree. Don't forget the Japanese version of the F-86 Sabre. Even that import plane and could be odd? It is a big part of Japanese Jet Aviation. It could be different from the American one. I found some planes that are not on your list. The T-1 was designed and built as trainer, it wasn't supposed to fight(as its armament suggests). The only plausible tier X for the IJA is the Sabre, unless there's a Japanese project i'm not aware of able to fit in that tier. Still remains the problem for tier IX. -With two branches there will be problems regarding the slots to fill at tier IX and X(four rather than two). In any case personally i would focus on Nakajima first since it's slightly easier. I wonder if WG would do the same or if they would mix the two. 2)The Campini engine is unlikely to be present ingame since it is a piston engine moving a compressor. As thrust is concerned isn't great, as it was shown by the C.C.2(or Campini N.1, it's the same plane). 4)The He-162 used the BMW turbojet engines, at least as far as i'm aware of. Only the Japanese version used the pulse jet on it. A question: was the R2Y armed? With guns i mean. As far as i recall it wasn't but probably i'm wrong(i don't have much information regarding it). As the rest is concerned is great, good job! Edited by Demon93IT, 05 March 2014 - 09:01 AM. Both versions are on the alternate list (twin-boom Ki-94-I and Ki-94-II monoplane). This is on the the proposed tech tree at Tier V as a development of the Ki-61. These are on the proposed tech tree at Tier VI and VII based on their speeds and engine upgrades. I will rename them to N1K1-J and N1K2-J so that they are not mistaken for floatplanes. There are difficult decisions to make with so many interesting aircraft available, yet I have tried not to supplant developers' judgement with my own. My goal has been simply to map it out in a logical manner so that they can make decisions about how to implement it without being overwhelmed by the research aspect (see "Guidelines"). I have not ventured to explore imported jets because I think that the best case should be made for native development first ("begin at the beginning"). To be fair, a developer could look at the ideas presented here and say, "well, that is all very interesting, but how can I make it fun?" That is why I think that the next step, after researching the tech tree and viable alternatives, would be to identify the flight characteristics and themes of each avenue. What characterizes the Nakajima line? What makes it an exciting alternative to the maneuverable Mitsubishi? 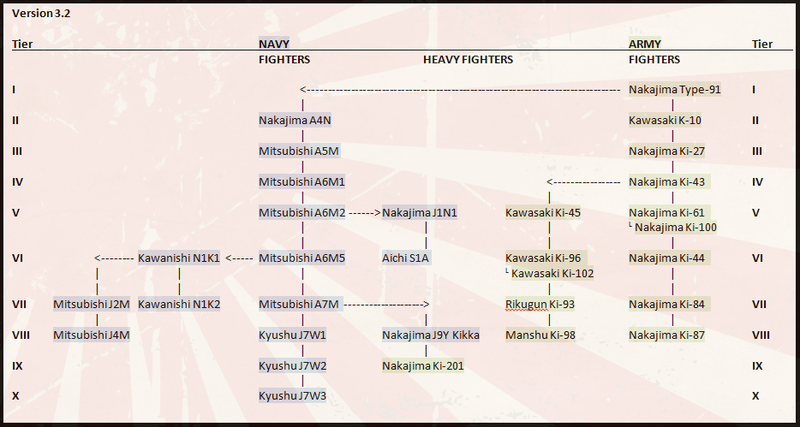 What about the muddy water between the "heavy fighters" and "ground attack" roles? I don't have the answers to those questions (yet) but I would like to keep going. I am thankful that there are others that share my enthusiasm for the history and the game. I have also added sources to the original post for pictures, paint schemes, etc. I have not yet seen any listing of armament for the R2Y2. The best information so far is here in which he claims development shifted from a reconnaissance role to an attack role. There are also some notes here (2010) by Edwin Dyer posting as "Hikoki1946". There may be more information in his 2009 book, which I hope to get later this week, will update. 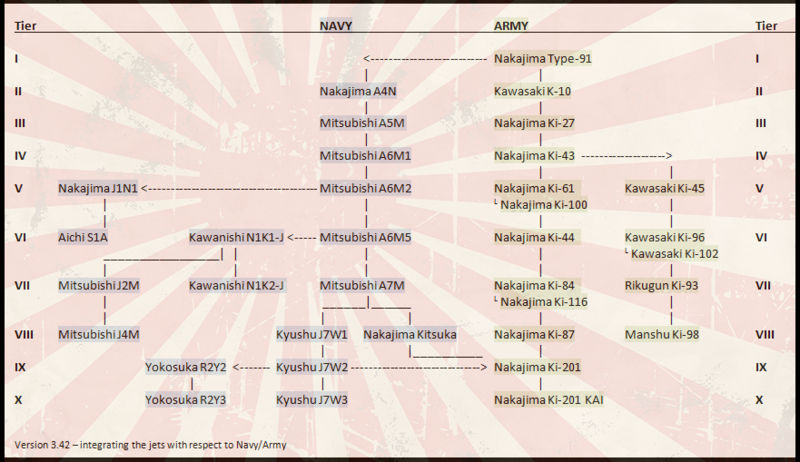 to indicate the Nakajima IJA line as the major parallel track from which smaller specializations can be made. The new structure also makes it easier to incorporate other aircraft (if more are needed) based on their armament lineage, particularly at lower tiers. It maybe not a tier X.... But maybe could be a VIII or IX for one branch tree that needs a jet. I would also think it would be good at maneuverability. Armament could be changed to even with their own tier. If the Japanese wasn't restricted with their military after the war. They might load other armaments and not uncommon too add new weapons to a current squadrons that were never design to carry it. Trainer are unlimited with what kinds armaments could be fitted. Because they were used a test beds sometimes. Note that the 2nd crew member could be useful in other roles. Sabre is a good plausible and maybe have characteristics changes than the US one. Well it would become a what-if plane then. We'll see anyway.